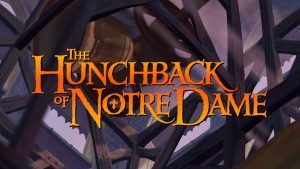 The Hunchback of Notre Dame is a classic tale of love, betrayal, jealousy, and redemption. Set in Paris during 1482, Notre Dame is the central focus. The twisted, and intriguing tale is one will send you through a furor of emotions and have you feeling the pain of the Hunchback Quasimodo. The complex tale starts with Quasimodo being crowned Pope of Fools and being paraded around and mocked by the crowds for his ugly appearance. A vicious circle ensues incorporating the poet Gringoire, Quasimodo’s guardian Frollo, Phoebus, all of who have a special connection to the lovely maiden La Esmeralda. Jealousy, murder and betrayal lead to the untimely death of La Esmeralda at the hands of Frollo while the hunchback watches from the bell tower. While he has a deep love and respect for his saviour Frollo he cannot look past the fact that he has taken the love of his life from him. He throws Frollo to his death. Years later the remains of La Esmeralda and the skeleton of the Pope of Fools protectively shielding her are found. The bell tower holds tremendous significance. This is the place where the deformed man finds peace and sanctuary. It’s the vantage point from where he first lays eyes on La Esmeralda and falls in love with her. Bell ringing in the tower is what has led to a further abnormality, deafness. He saves La Esmeralda from death, keeping her safe in the bell tower. It is from here that he sees his love lose her life to his guardian and kills him. Every important aspect is centred around the Notre Dame bell tower. A true tale of love until death. When Quasimodo finds the remains of the dead La Esmeralda, he dies with his body protecting her. Together they turn to dust and, love is finally realised in death.